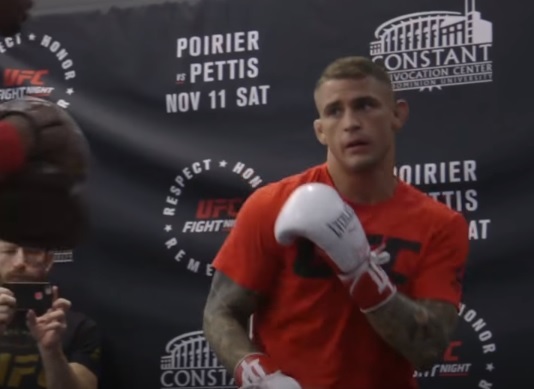 Although Dustin Poirier has worked his way into title contention, the lightweight elected to face Nate Diaz at UFC 230, and recently he explained why. After Poirier took out Eddie Alvarez in July, the former featherweight made it clear he wanted to fight for the title next. But, since then, Poirier’s been booked to fight Diaz on November 3rd. You know, I do. Every fight is a gamble; you never know what’s going to happen. But I’m not the kind of guy to sit around and wait, you know? Even if I would have done that, there’s no telling when the winner of Conor-Khabib would be ready to defend the belt again. And even if they did make a quick turnaround, if Tony Ferguson beats Anthony Pettis, he was the interim champ so I believe he’s probably ahead of me. I’m not just going to sit around and wait a year for a title shot. I enjoy fighting and I enjoy training. I still enjoy it, so I don’t want to sit around for a year. I like to be in training camp, pushing myself, learning, getting better and this kind of fight right here is a fight that made a lot of sense to me. It’s a fun fight, a guy that I’ve been watching for a long time, a guy that I’m a fan of- him and his brother- and it’s a legacy fight for me. Poirier (24-5, 1 no contest) has gone undefeated in his last five fights, and has won his last three. UFC 230 will be hosted by Madison Square Garden in New York City.